The entire trail is 10 miles one way, so it may depend on where you jump on. The thought of bicycling along a highway likely conjures up images of traffic and smog; not exactly what most cyclists are looking for. 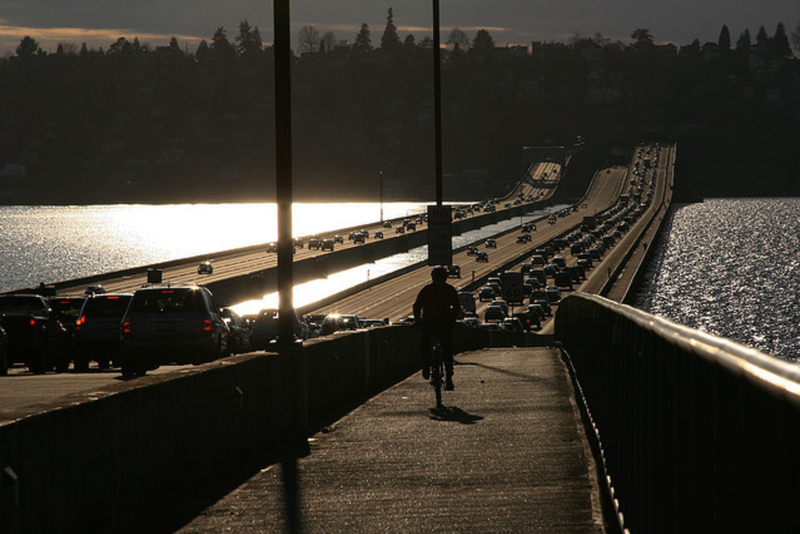 But Seattle’s I-90 Trail just might change that perception. Also called the Mountains-to-Sound Trail (and a subset of the 100-mile Mountains-to-Sound Greenway), the ten-mile path from Beacon Hill, across Lake Washington and on to Bellevue turns out to be a quality route that offers some of the finest views available in the city. There are many places to pick it up along the way, but if you want to start from the trail’s beginning find it on 12th Avenue in Dr. José Rizal Park (just south of where I-90 intersects with I-5 on the west side of Beacon Hill). From here the trail continues along I-90, winding east toward Lake Washington. But don’t worry, the highway itself won’t be a constant eyesore: For much of the course you won’t even know that I-90 is there, as the cars are routed beneath landscaped walls. And then comes the highlight of the journey: cycling across the Lacey V. Murrow Memorial Bridge, I-90’s famous floating passageway across Lake Washington. The bridge may have gained an unfortunate notoriety in 1990 when the whole thing actually sank (Seriously! Thankfully, no one was hurt), but rest assured that they have re-engineered it with your safety in mind. The only thing that’s killer here are the sweeping panoramas you’ll see of Lake Washington, the shores of Mercer Island, and the Cascade Mountains beyond. 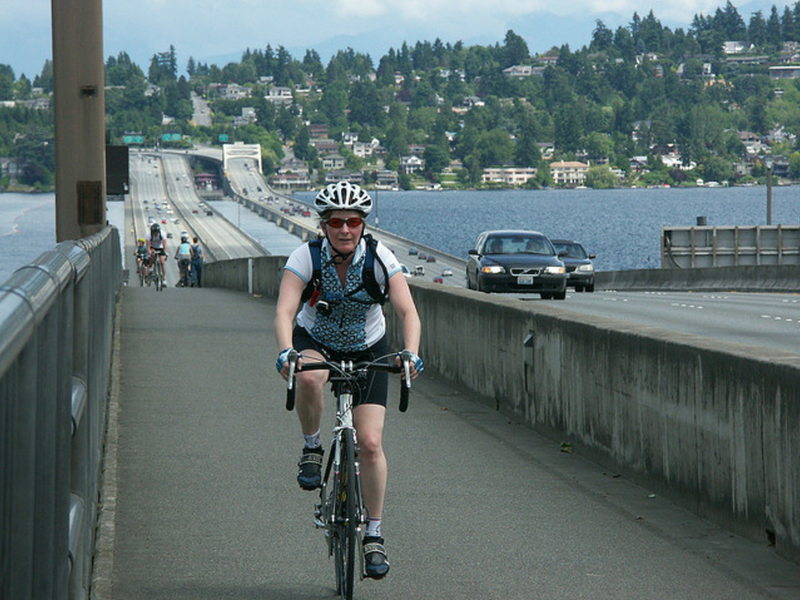 Across the bridge, the trail reaches Mercer Island. It then goes across it by way of Aubrey Davis Park and then the landscaped freeway corridor, where it continues on to Bellevue and the Mercer Slough Nature Park. 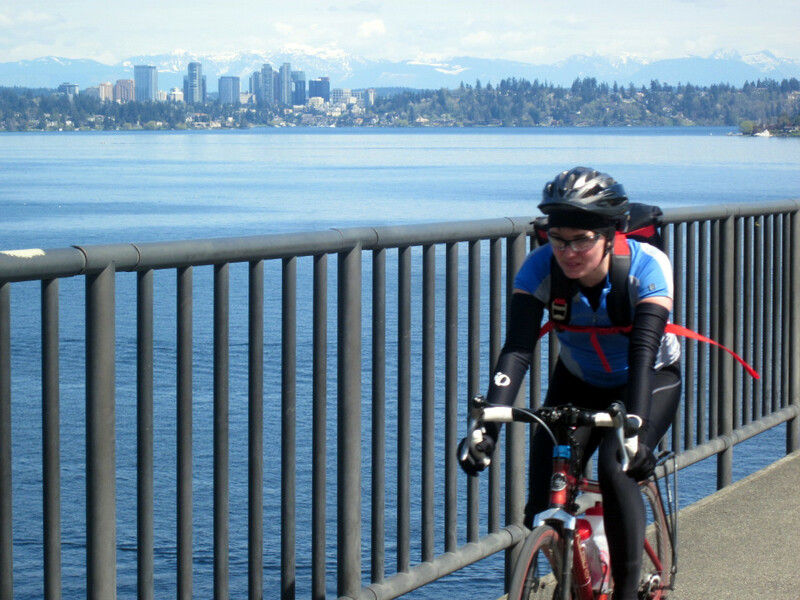 If you’re looking for an even longer ride, the I-90 trail connects with many other good cycling routes, giving you plenty of options to extend the journey: a loop around Mercer Island, or a loop around Seward Park, are both great options. Seattle traffic can certainly be wearisome, and the commute across I-90 is no exception. If you’re feeling tired of getting stuck in gridlock, this is your opportunity to get out of the car and let your inner cyclist reclaim the road. You can’t help but feel a bit smug as you whiz past all those suckers stuck on four wheels instead of two. Depending on where you want to start, the best places to park are on 12th Avenue in Dr. José Rizal Park, in Aubrey Davis Park in Mercer Island. If you’re cycling from the other direction, you can park at the Enatai Beach Park in Bellevue, at 108th Avenue SE.